Introduction. 2. Surface coating methods. 3. Tribology of coatings. 4. Tribological properties of coatings. 5. Coating characterization and evaluation. 6. Coating selection. 7. Applications. Appendix. References. Subject index. 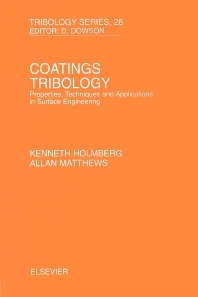 This book presents a general view on thin surface coatings used for tribological applications and it is based on the current state of understanding. The mechanisms of friction and wear in sliding and rolling contacts of coated surfaces are described. Basic information on coating techniques, tribology and surface mechanisms is given. Based on collected experimental works information is given on the properties of thin soft coatings, such as polymer, lamellar solid and soft metal coatings; thin hard coatings, such as nitride, carbide, oxide, boride and diamond and diamond-like coatings; and multi-component and multi-layer coatings. The influence of interface layers and lubricants is highlighted. The methods available for characterization of coated surfaces and for mechanical and chemical evaluation of their tribological properties are described. Tribological evaluation methods for accelerated and field testing and the need for standardization of quality assurance procedures are discussed. A methodology for the selection of thin coatings for tribological applications is presented and knowledge based expert system approaches for coating selection are reviewed. For different application examples, the basic tribological contact mechanisms are described and the possibilities for improving their tribological properties by using surface coatings are discussed. The application examples include sliding and rolling bearings, gears, tools for cutting and forming, erosion resistant applications, magnetic recording systems and bio-medical implants.